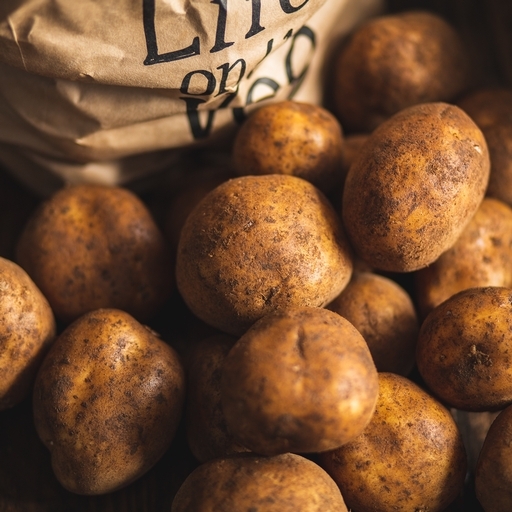 We choose the potato varieties that taste best, and allow them to grow slowly to develop maximum flavour. The variety changes every week, each with their own cooking virtues. Look out for the tips on every bag to help you make the most of each week’s pick. Layer with cream and garlic for potato dauphinoise, chop into chunky wedges or transform into fantastically crunchy roast potatoes. Leftovers mashed with grated beetroot or cooked greens make brightly-coloured bubble and squeak. We start the season with new potatoes in early May, moving to salad potatoes in July. For the rest of the year we use maincrop varieties that change as the season progresses. Waxy varieties are good for boiling and in salads. These include Colleen, Charlotte, Lady Crystal, Lady Felicia, Jersey Royal, Maris Peer, Pink Fir Apple, Nicola and Novello. Our floury varieties for mash, chips, roasting and baking are King Edward, Cosmos, Desiree and Sante. Good all-rounders are Marfona, Robinta, Ostara, Romano, Orla, Valor, Estima and Maris Piper.